Back in June soon after Apple offered a sneak peek at the new Mac Pro, a Geekbench result from the new machine appeared revealing some performance information about the machine under its internal product code name of AAPLJ90,1. That machine was running a 12-core Intel Xeon E5-2697 v2 at 2.7 GHz, representing what would be a high-end model of the machine. Today, a new Geekbench result that appears to be a second legitimate Mac Pro has appeared, this time running a lower-end 8-core Intel Xeon E5-1680 v2 chip at 3.0 GHz. As with the previous Mac Pro seen on Geekbench, this new machine is running a custom internal build of OS X Mavericks, in this case Build 13A3010. 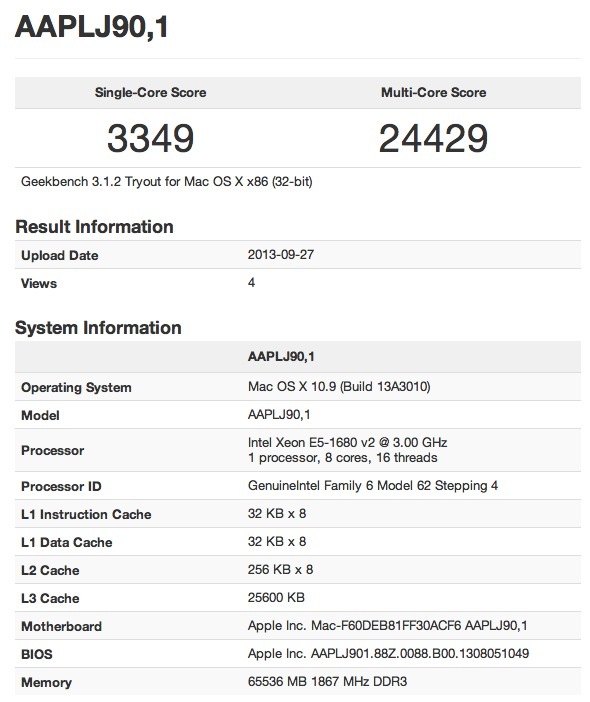 Exact Geekbench scores are not comparable between the two Mac Pro models, as the original one was benchmarked using Geekbench 2 and the new one was benchmarked under Geekbench 3, which uses a new baseline measure. 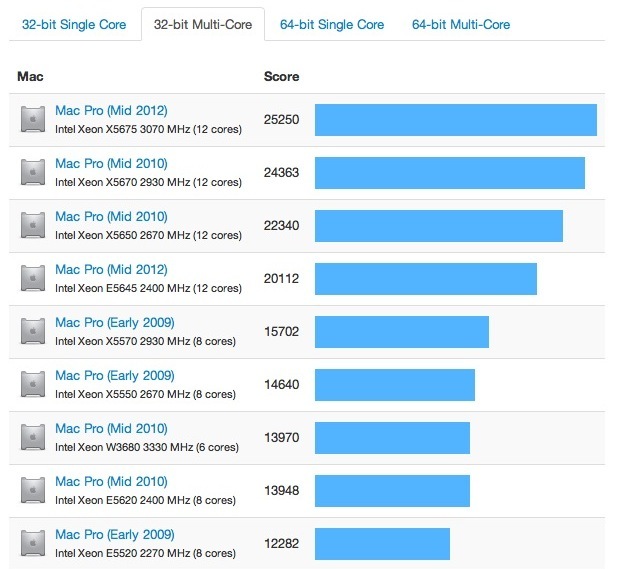 The latest machine can, however, be compared to other Mac models tested using Geekbench 3. While Geekbench can assess raw CPU and memory performance, Apple's new Mac Pro will also bring massive new graphics capabilities that can be leveraged for computational purposes. The new Mac Pro will come with dual AMD FirePro GPUs standard, giving users additional computational horsepower while being able to simultaneously drive up to three 4K displays. Apple's new Mac Pro is scheduled for release this fall, but the company has yet to announced detailed specifications, pricing, or an exact release date. Ah finally some Mac Rumors. Feels good. are Pro users satisfied with new design ? But does it come with a grater and in different colours? That'll be the killer deal. That's great, but this is a workstation. yes! !, mac news. really excited with this mac pro. It really annoys me to hear people whine about the cost of these machines. First, if you've wanted a new one it's not like you haven't had YEARS to save. Second, they're called a MacPro for a reason...Pro, as in "Professional." Some of us actually use this machine for our livelihood. These machines are the workhorses that get our jobs done quickly and efficiently day-in and day-out. Finally, whatever the cost is, it's easily made back many times over by the job it helps us do and the productivity that is gained with it's speed and stability. To borrow a pharmaceutical term, if you are using this for gaming it's an "off label" use. You are not the target market. These machines are primarily designed for creative, scientific and IT-related professionals. So, if you choose to use these machines for purposes other than their intended use cases and then whine about, you're not going to find a lot of sympathy here. The largest RAM DIMMs available are 32 GB. So your servers have 48 memory slots? The only server arrangement in the world that could do this is a completely maxed out AMD Magny-Cours arrangement, because it supports distributed shared memory with 4 CPU sockets and 12 DIMMs per CPU.